Smoked Salmon is a natural source of Omega 3 Polyunsaturated Fatty Acids. Our salmon is caught in crystal clear waters and chosen to ensure the high quality the company prides itself in always attaining. At our family owned and operated smokehouse, we follow the time-honoured techniques for smoking. The salmon is carefully filleted, individually cured by hand and then smoked to perfection before being sliced for your convenience. 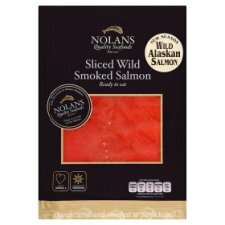 The end result is a delicious smoked salmon of incomparable flavour, texture and appearance. We hope you enjoy one of the World's great delicacies. While every effort has been made to remove bones some may still remain. Keep refrigerated at 0°C to +3°C and consume within 48 hours of opening. Suitable for home freezing. This product may have been previously frozen and returned to chill temperature under controlled conditions. Freeze on day of purchase, use within one month. Defrost thoroughly in a refrigerator for at least 4 hours before eating. Do not refreeze once defrosted.